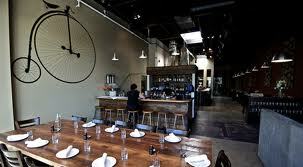 For a few years now, I’ve had a bucket list of Portland restaurants I’ve wanted to try. Some are out of my budget. Some are just impossible to get into–like Tasty n’ Sons. Michael and I have tried to go to this restaurant multiple times now and the wait was always too long. The “thing” to do in restaurant management here in Portland seems to be to have very small dining areas and accept NO reservations so that there’s always a line, thus creating demand and buzz. I find this pretentious and I’m rarely willing to wait over an hour for a seat to eat a meal. Thursday night Michael’s father was visiting from Texas and the plan was to go to Meriwether’s–a tried and true favorite. The traffic was atrocious and we missed our reservation time trying to get from the airport to NW. I said screw it, let’s find anything. It was by change and luck that Tasty n’ Sons did NOT have a wait out the door! Michael and his dad were parking the car and I dashed into the restaurant to get us on the list. Miraculously there were tables free! The server was reluctant to seat me since my “party” wasn’t with me (apparently they won’t seat people there unless everyone has arrived). I guaranteed they were right behind me (do I need to offer my first born son, too??) and she let me squat at a table til they arrived. 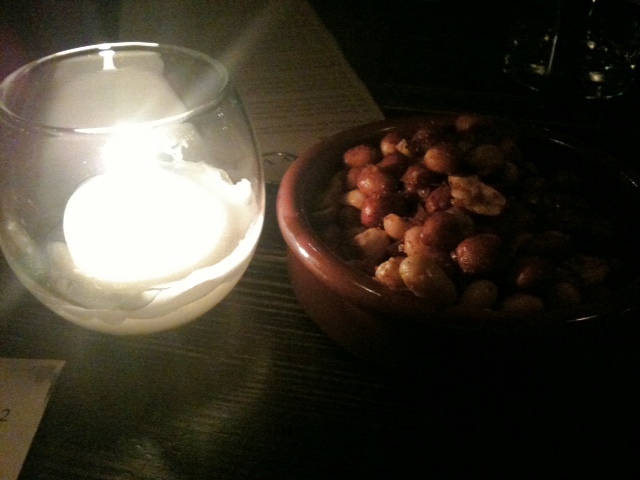 I munched on the oddly salty and sweet roasted peanuts that were at the table. They were delicious. 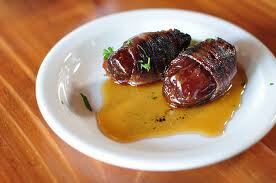 Michael ordered us the dates wrapped in bacon and smothered with maple syrup. At first I scoffed at the appetizer because I’ve never had dates before and it honestly sounded like a train wreck of sweetness and crunch. But I trust Michael’s palette and knew he’d never order something that was grotesquely sweet. Three tiny dates arrived on a small plate like lumps of coal. I was still apprehensive but decided to give it a try. The dates were wrapped in bacon and there was an almond wrapped inside of it. I took a bite and it was…squishy…The flavor was mild but the texture was what I cringed at until Michael instructed me to eat the whole thing in one bite. Much better decision. I popped the remainder in my mouth and it was an explosion of breakfast in my mouth. The combination of flavors of fruit, maple syrup, almonds and bacon tasted exactly like a waffle–or french toast. It was marvelous. In one bite I got to experience my favorite carby-breakfast treats. There’s no way I could ever eat more than one, maybe two, of these little suckers but it was enjoyable. The next appetizer arrived on a mound of thin french fries: the “Pretty Damn Good Chicken Strips” and these were gosh darn golly gee pretty darn good. 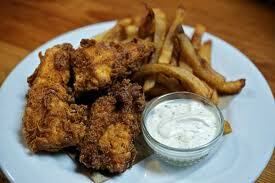 They weren’t drenched in grease like chicken strips tend to be and the garlic/ranch/aioli dipping sauce was addicting. 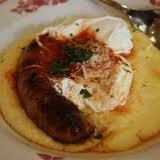 My entree was the polenta with peppers and sausage. The polenta tasted just like the cheesy grits I had in Texas. Cheesy grits and polenta need to be in every meal. 🙂 I loved the polenta! The sausage was really spicy with a hint of fennel. I had a glass of wine that was a Sangiovese and Cabernet blend. It was the kind of full-bodied red you want to sip slowly while you cut into a juicy steak smothered in onions and a bernaise sauce. Even though the wine was bold, it wasn’t overpowering like a lot of cabernet blends can be. I wouldn’t order this wine with something delicate like fish but it complimented my sausage and polenta entree nicely. 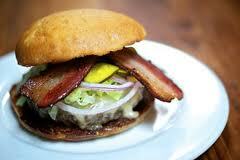 Michael got the “The Tasty Burger”–bacon and smoked bleu cheese with sweet pickles on it. I had one bite and enjoyed every smokey burst of flavor in it. Michael wasn’t blown away by the burger, though. He felt like it wasn’t as juicy as some of the other amazing burgers we’ve tried in our Quest. I’d rate this restaurant at a solid A-. The service was awesome, despite the weirdness about getting a table, and the food was delicious. I’m a tad disappointed Michael didn’t think their burger was outstanding, so it’s not going on our Burger Quest list at this time. QUESTION: Are restaurants difficult to get into in your town? How long are you willing to wait for a table? Mmmm I loooove dates! I saw a little recipe last night in a magazine for dates stuffed with blue cheese and topped with an almond… yum! I was pleasantly surprised at how yummy it was. I bet your recipe would be a treat too! So glad you finally got it there. Our friends waited TWO HOURS in line there for Mother’s Day. I thought they were CRAZY, and they thought they were too until they had the food (again) and decided they’d do it all over again. Horray for dates – they’re so good and super versatile. A great natural sweetener. 2 hours is EXCESSIVE! I don’t care how good the food is! I love, love, love dates! Dates with nut butter. Yum! I keep reading about dates with bacon and I want to try them next time we buy bacon (and I remember). Getting into restaurants around here isn’t too hard, although the chain ones seem to get more crowded for whatever reason. I won’t wait more than 20 minutes for a table. We hate crowds and if the wait is that long, it means it is too crowded for us. I’m a date newbie! The ones at Tasty n’ Sons were pretty amazing! I would have them again. The thing with Portland restaurants is that we rarely go to a chain. 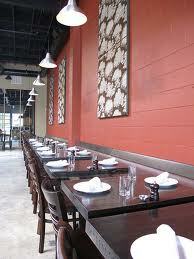 We want to try the new and famous restaurants so there’s more of a wait for sure. I rarely want to wait longer than about 30 minutes or so. HI Lisa. I LOVE the look of the date appetizer. Hope you are having a fantastic Friday. You would love it! It was so good!